SINGAPORE - Life for Mrs Dolly Leow now is very different compared to when she was a child some 60 years ago. There were no mobile phones and television sets, and not even plastic bags, she said, recalling how her mother would carry a basket to the market. Mrs Leow, 64, is a storyteller at the Singapore Bicentennial Roadshow @ South East, which was launched on Sunday (April 14) at Wisma Geylang Serai. It will run until next Sunday. It is the first roadshow in a series of five that aims to bring Singapore's history to the heartland so it can be more accessible to Singaporeans. Said Mrs Leow, who is a childcare literacy teacher: "I want to talk about the way we used to live, without all the trappings - electronics and the like. "We kept ourselves entertained. We looked out for the bread man who would balance his goods on his head. We listened for the tock-tock-tock sound that signified the arrival of the wonton mee man. Of the storytelling sessions, mayor of the South East District Maliki Osman said: "This is something that is unique. 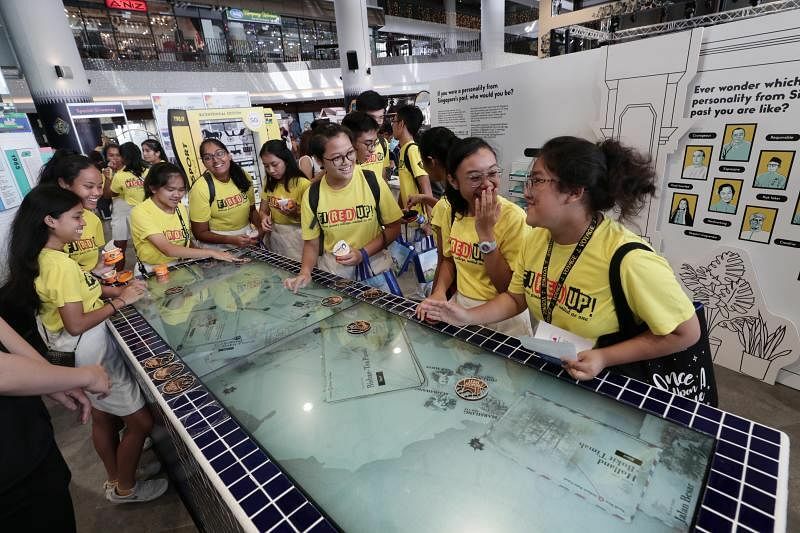 We often look at historical exhibitions as just what's being written, but when you hear the stories, we hope to bring back memories for Singaporeans. "We wanted to provide a new experience for visitors, apart from looking at Singapore's 700-year history and beyond. We wanted to bring history as told from individual perspectives," said Dr Maliki. "We are from many communities, cultures and religions but we also have this one shared history in common," Mr Tan said, adding that this shared history has "contributed to where we are today". "That's why it's important to understand this shared history, and also how our own communities have contributed to Singapore's growth and development over the years... and we can build a DNA for ourselves today to get ready for the future." There is also a specially curated heritage trail where visitors can learn about the history of various landmarks in the Geylang Serai area, including the Khadijah Mosque, the former Geylang Serai Fire Station and the Haig Road Market and Food Centre. The next stop for the roadshows, which is on every month till August, is the HDB Hub. After that, the roadshow will go on to Our Tampines Hub, Northpoint City and Lot One Shopper's Mall Atrium.